I recently had the opportunity to write about two wonderful bilingual picture books. 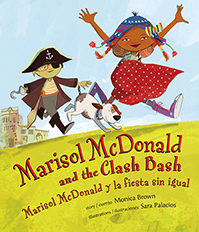 Marisol McDonald no combina and Marisol McDonald y la fiesta sin igual are written by Monica Brown and illustrated by Sara Palacios. Read more about the books and my extension activities for language learners. Lee & Low publishes these books and has generously provided two copies of each for me to give to two Spanish Playground readers. Read more about Lee & Low and see the product pages for the books here: Marisol McDonald no combina and Marisol McDonald y la fiesta sin igual. The protagonist of these stories, Marisol, is bilingual and multicultural and has all she needs to take on today’s complicated world. Marisol McDonald doesn’t match because she chooses to draw from different cultures, languages and interests to create the world she wants to live in. She is unique, but not alone; she is a free spirit that pulls others to her. Her individuality is treasured by her family, friends and teacher. This giveaway is now closed. Numbers 1 and 4 were selected using random.org. Congratulations to Cecelia and Tamara and thank you to everyone who entered. – To enter the giveaway for these two books, all I really need is a comment so that I have your email and can notify you if you win. No one else sees your email. – The comment can be anything, but I would love to know how you nurture individuality in your children or students and encourage them to be true to themselves. Use the comment form below to enter. – You can also enter on the Facebook announcement of this giveaway for a double entry. – Entries close Friday, Dec. 6 at 11:59 pm. The winners will be announced on Saturday, Dec. 7. Read Spanish Playground’s official giveaway rules for more information. What an interesting question. As a mother I want to have my kid’s heart, I think that the first thing I try to do is accept how my kid’s personalities are. If there are things that need to be corrected I try to do it with love. And if there are things that need to be praised I also do it. I try not to make comparisons among my kids, or other children. I do not thing is a good thing to talk a about physical differences, but similarities. I do not go with speeches that go against any race, I remind them that God made us all equal but different. When somebody tells me what a pretty little girl or handsome little boy you have. I reply with a smile, thank you, they are good kids. La belleza es efimera, no somos mas que ciudadanos de este mundo hechos por un mismo Dios. One of mine, Will, comes up with fun suggestions. He’ll see something in his world that sparks his interest, and wants to do it–right then. Like he might see a plane in the air and say, “I want to fly in a plane papá.” And instead of giving him a real world answer like, “Plane rides are expensive” I’ll say, “Sure, let’s grab a cardboard box and we’ll make one.” I like not saying no all the time (a thing I swore as a child I wouldn’t do when I had kids). We nurture his fun side and he nurtures his whole family’s creativity. I have no children of my own, so I consider my students as my 300 children. I nurture individuality in my students by giving them the opportunity to make choices in the classroom and exposing them to a variety of activities so that they can decide how best they express themselves. This books would be fabulous to use in support of 1st grade’s IB planner, “Stories teach us about making choices”. 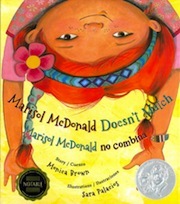 Your book, Marisol McDonald no combina, reminds me of my heritage speakers. They are constantly having to “decide” between home life identity and “American” school identity. I try to encourage them to just be themselves! It’s ok if you Spanish at home and English at school, or even Spanglish. It’s ok if you eat tacos on Thanksgiving. They get the chance to create a brand new culture and identity and I do my best to encourage them every day to embrace that. Writing their own journals, books, songs, poems, etc are great ways to express their feelings and experiences and I feel like this book is the perfect example of that. I don’t have children, but I’m an elementary school teacher. I try to encourage my students in their individuality by noticing their unique choices, and often saying yes when they ask “Can I?” I’m referring to projects we do in class and coloring activities. They often ask, “Can I draw a monster instead of just a person?” and I say yes as long as it gets the point across. These books look great! I would say I nurture my son’s individuality by supporting the choices he makes, even when they are unusual, and by widening our horizons so that we all see that there are so many unique and different ways to be who you are. My daughter is younger, so like Tamara said, it’s more a question of not comparing and just letting her personality emerge. These books look wonderful! I try to help my students be themselves by letting them be goofie and finding ways to put that power into learning. I would love some great books for my classroom! I would say I nurture individuality by letting students think for themselves and making projects that they can do differently but still meet the requirements. Hola! I requested Marisol McDonald Doesn’t Match this weekend at my local library. I read the book to my students and they really enjoyed it. The school I work for has many biracial and multiracial students. After I read the story all students praised how much they enjoyed the story and how they’re allowed to dress themselves just like Marisol any way they choose. I told all my students they are all special and unique in their own way. One even said ,” We don’t have to listen to what anyone says how we look.” I appreciated you putting this book on your website. I always check out books you reccomend on your site! Hola! My own four children are almost all grown up, the last one is a jr. in high school. I taught all of them in school because I was the only Spanish teacher and two of them went on to be very fluent and even strive to be fluent in a couple of other languages, two of them decided it wasn’t for them and only did the mandatory classes in school. I never wanted to push them so hard that they ended up hating it and because of that they are now realizing they could really use it in their professions and are working hard to improve their fluency. I try to do the same thing with my kids at school. I tell my native speakers to be proud of their heritage and their knowledge of two (or more) languages and that they deserve to be able to take an “easy class” for once since most of them had to struggle the first few years to learn english and all of the stuff in their classes as well. I think I am a lot like Marisol because I have a very ecclectic style and I speak a variety of languages and embrace many things from a diverse set of cultures. So my kids also learn about yoga and meditation, tai chi and salsa and merengue. We bring in foods from all kinds of different countries and listen to many different kinds of music. We talk about stereo typing and respecting diverse cultures. I have guest speakers that are from all over the world and the Peace Corps. I want to open their minds to the beauty of our world and its diversity. We are in a very rural area and many of them have never been to a big city, nevermind another country. So one of my biggest goals is that when they leave my class they see things a little differently than when they came in. I think this book would fit in so perfectly with my classes. Thank you for the opportunity to win it! Both as a parent of two young boys and as a teacher, my role has always been to nurture what drives my children; to open up the path for and encourage that which inspires them and drives them. I am still learning to understand ALL my children and appreciate them fully for their individuality, which has also served as a learning experience for me as well. As a former early childhood classroom teacher and now working with parents and their small children, it was always important to provide a non-threatening atmosphere where children could be themselves or try on different hats and to play when learning, seeing that young children are best at, and love to play. A large amount of time we spent together was in self-directed centers that provided many opportunities to play providing rich materials and different modes of learning that allowed the children to decide where and for how long they wanted to explore and create. It was more important for me to follow their lead and play along with them to assist them with their learning. This is similar to how we play at home with my own children. We follow their lead in the things they want and are interested in, so that we can assist them or support them the best we can in those endeavors. It has been important for our children to be connected with all of our family (many of which are Spanish only speakers living in another country) and we’ve worked very hard in our local public school system to be able to bring a Dual Language program to my son and niece’s school, so not only they can continue their Spanish language learning academically, and not just socially with their family, but for their bilingual peers. Many of the kids at their school are English Language learners in a subtractive language learning district–immersing them in English and taking their Spanish language support by their third year in the school. With Dual Language, the children are learning both English and Spanish academically and simultaneously. Not easy as the pilot program in the district, but an amazing experience because his social peers along with his family at home are able to value the language and culture more wholly, and he can be honored and appreciated much more fully for the language and culture that he brings to his school environment. Since our first son shows an interest in language learning, he has also been taking Mandarin Chinese classes, so that now, he can experience learning a language and culture different from his own too, and he is easily motivated, appreciative of this privilege, and respectful of his learning. Exposing our children to different friends and situations, socio-economically, culturally, and through language, arts, and spiritually, we hope to instill respect for individuality. These are basic examples of what ‘nurturing individuality’ would look like in my classroom and home with all my children. Our family keeps the mantra of being respectful, helpful, & kind at all times, and with this we hope to continue nurturing and encouraging each other’s individuality.